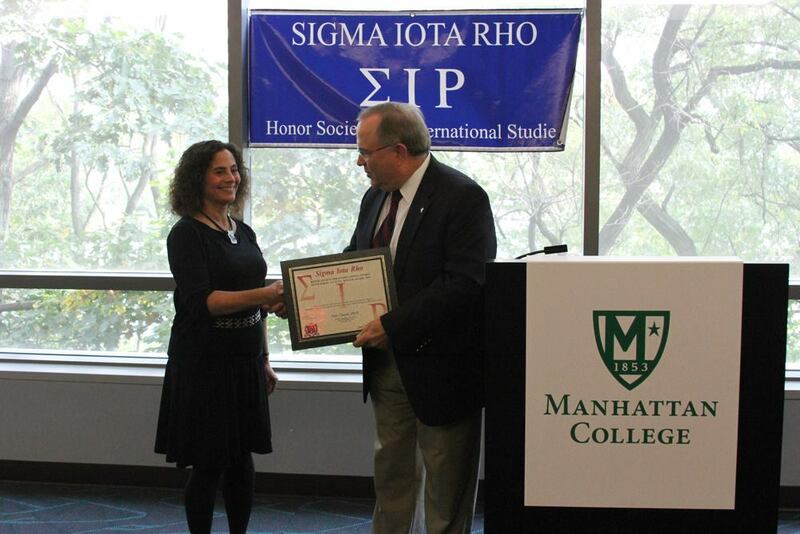 Pamela Chasek, Ph.D., professor and chair of the government department at Manhattan College, received the fourth annual Sigma Iota Rho Outstanding Faculty Advisor Award on Oct. 14. A member of the College’s faculty since 2000, Chasek is the author and editor of several books on international environmental policy. She has published articles on the United Nations and multilateral environmental negotiations, and is also the editor of the Earth Negotiations Bulletin, a reporting service on environment and development negotiations at the United Nations. Chasek also runs the Model United Nations program for Manhattan College. During her time at Manhattan College, Chasek received the Fulbright Senior Scholar Award for research at Victoria University of Wellington, New Zealand in 2007. In addition, Chasek serves as the liaison for the American University Washington semester program, which allows students to intern in Washington, DC and take a seminar in areas such as American politics, economic policy, foreign policy, and international business and trade. Founded in 1984, Sigma Iota Rho is a collegiate honor society for international studies recognized by the International Studies Association. Its purpose is to promote and reward scholarship and service among students and faculty in higher education so as to foster creative performance and integrity in the conduct of world affairs. The Manhattan College Beta Eta chapter is one of 140 national chapters of Sigma Iota Rho.